Impact for Change is a programme designed by Corporate Citizenship to help companies measure, improve and communicate their impacts. As part of the programme Corporate Citizenship will be publishing a selection of research papers and reports, in addition to hosting a series of webinars, seminars and receptions which focus on the topic of impact. In this short film, Corporate Citizenship explores how the relationships between business and society are becoming more complex, and as businesses are being asked tougher questions about their impacts, the importance of mapping, measuring and taking action on impacts across the value chain is now paramount. Diageo and Civicus share insights on how organisations can use a better understanding of their economic, social and environmental impacts to focus their efforts and drive change where it matters most. Research by Corporate Citizenship reveals that an era of collaboration is upon us. As companies aspire to achieve greater societal impact, they are moving away from traditional partnership models and seeking out new models of collaboration. This report highlights five key models of collaboration and outlines the steps to a successful collaboration. Just one fifth of organisations believe that their impacts are understood by external audiences. 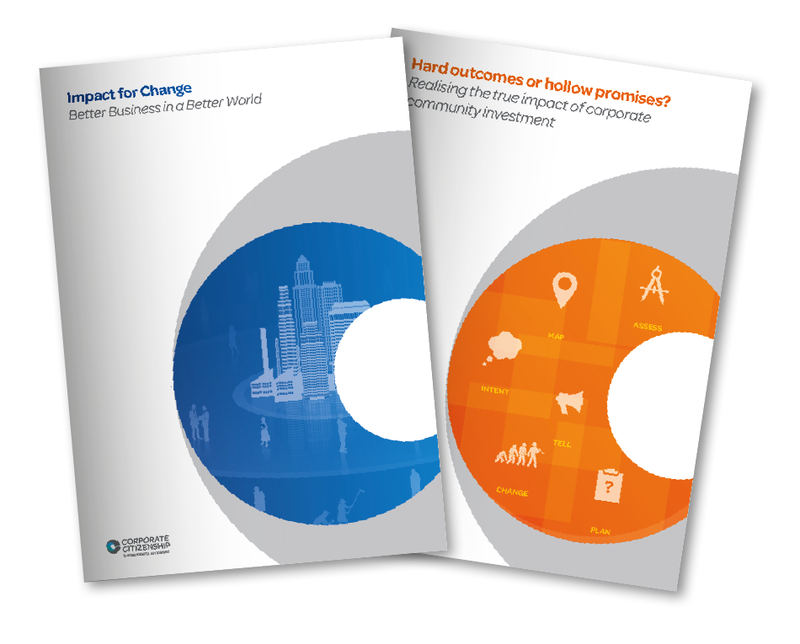 This report provides a solution to organisations that want to map, measure and take action on their most important social, environmental and economic impacts – closing this ‘impact knowledge gap’ and enabling organisations to explain their impacts to external audiences. Based on the insights of sustainability and corporate responsibility practitioners around the world, this report reveals a surprising and sizeable gap between corporate aspirations and reality when it comes to corporate community investment (CCI) and philanthropic activities.This report helps companies to close the impact-aspiration gap by overcoming challenges and barriers to community investment measurement. The report guides practitioners through the I.M.P.A.C.T approach, to effectively measure community investment impacts – creating benefits for both business and society. In this webinar, we share insights on how companies can use impact measurement to add real value to the business. We explore how companies can adopt an impact-focused lens to understand their greatest opportunities and challenges across the value chain. Webinar: Community Investment: Impact Action or Impact Aspiration? Do you know what impacts your corporate community investments or philanthropic activities are creating? New research by Corporate Citizenship reveals a disparity between the impacts practitioners want their organisations to achieve through community investment, and the results delivered. Impacts refers to the economic, social and environmental changes that business creates. From creating jobs and investing in local communities through to innovating new products and measuring a return for the business, we believe that the companies that will succeed in the long-run will be those that calculate and improve their impacts. Corporate Citizenship has been working with companies to enhance their impacts since 1997. Twenty years ago, we founded LBG, now the global standard for measuring corporate community investment. Today, we are working with clients across the globe to map their impacts and create engaging strategies that grow the positives, minimise the negatives, and create a more sustainable future where business can thrive. You can find out more about Corporate Citizenship’s Impact services here. If you would to discuss your impact needs with the team, please do get in touch. Visit the LBG website for further information on using the LBG framework to effectively measure your corporate community investment.